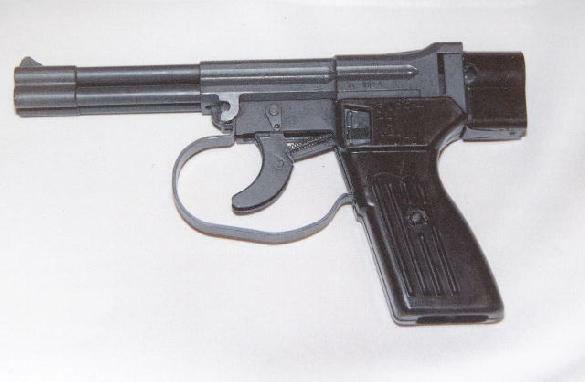 Approved for service in 1971, the 4.5 mm SPP-1 underwater pistol is a four-barrelled pistol firing a drag-stabilised dart with sufficient power to deliver a lethal effect at 50 m range in air or up to 17 m range underwater, the exact range being dependent upon the depth at which the pistol is fired; at 40 m depth the lethal range is reduced to 6 m. The lethal range involves the penetration of a padded underwater suit or a 5 mm thick glass facepiece. The dart is part of the special 4.5 × 39 mm SPS rounds, four of which are held in a special clip which is loaded into the barrels of the pistol from the rear and secured in place by the firing chamber and breech unit. A double-action firing mechanism then fires one cartridge sequentially for each pull of the trigger. During reloading, the clip with the spent cartridge cases is ejected manually. Fresh rounds are then pressed into the clip using a special tool carried in a waterproofed carrying case together with the pistol. If required loaded clips can be carried on a belt or sling inside waterproofed containers each holding one loaded clip. The lid of the waterproofed carrying case contains three of these holders while the case also contains a cleaning kit and materials. A complete set of SPP-1 equipment includes the pistol, 10 cartridge clips, holster, device for loading SPS cartridges into the clips and a special sling to carry the pistol and three containers with loaded clips. The SPP-1M pistol is essentially the same as the SPP-1 but with an additional spring above the sear to improve the trigger pull. In addition, the trigger guard is larger to accommodate diving gloves. The round-based 4.5 mm dart is 115 mm long and weighs 12.8 g. The complete SPS round is 145 mm long; each round weighing 17.5 g. Specifications Cartridge: 4.5 × 39 mm SPS Operation: breech loading four-shot repeater, tip-down barrels Feed: 4-round clip (see text) Weight: empty, 950 g; loaded, 1.03 kg Length: 244 mm Height: 136 mm Width: 37 mm Effective range: in air, 20 m; in water, 17 m at depth of 5 m; 11 m at depth of 20 m; 6 m at depth of 40 m Muzzle velocity: in air, 240-250 m/s Manufacturers TSNIITOCHMASH - Central Scientific Research Institute for Precision Machinery Construction 2 Zavodskaya Street, Klimovsk 142181, Moscow Region. Tula Ordnance Plant JSC 2 Metallistov St, Tula 30002, Russia. Agency Rosoboronexport Federal State Unitary Enterprise 21 Gogolevsky Boulevard, 119865 Moscow. Status In production. Offered for export sales. Service Russian and other RFAS special forces.